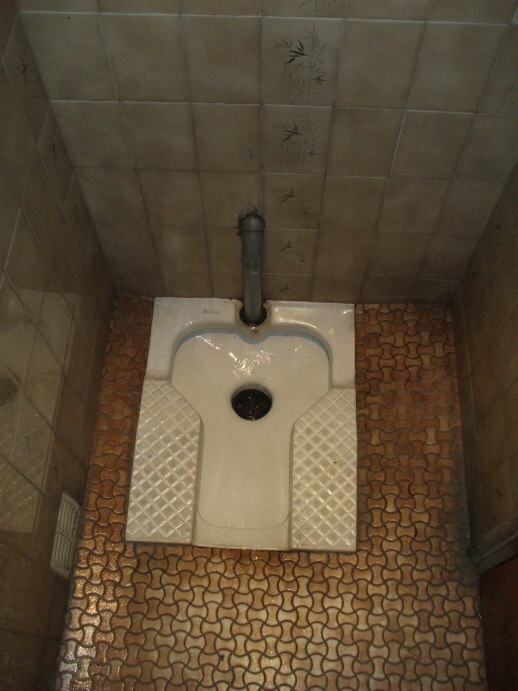 French toilets vary across the entire spectrum of plumbing, from basic pissoirs to the first automated public toilets. 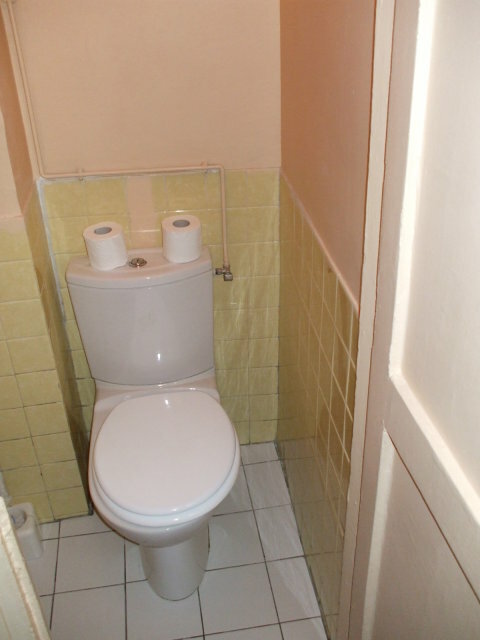 In low-cost French hotels, the toilet is likely to be down the hall and shared with the other rooms on the floor. The shower is also shared, and it may be on a different floor. 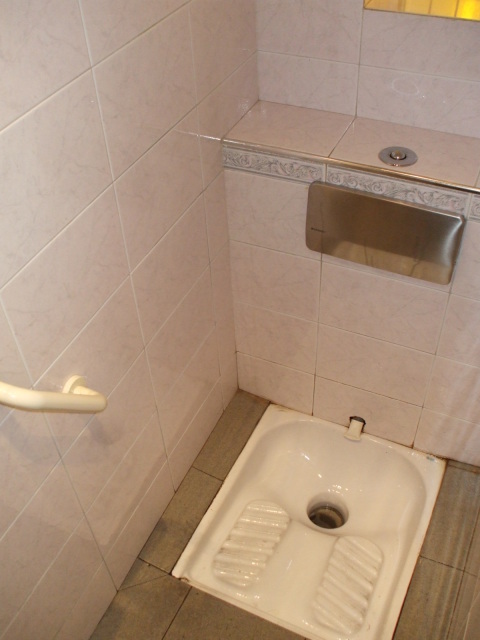 Your room will have a sink, and there's a good chance that it will also contain a bidet. 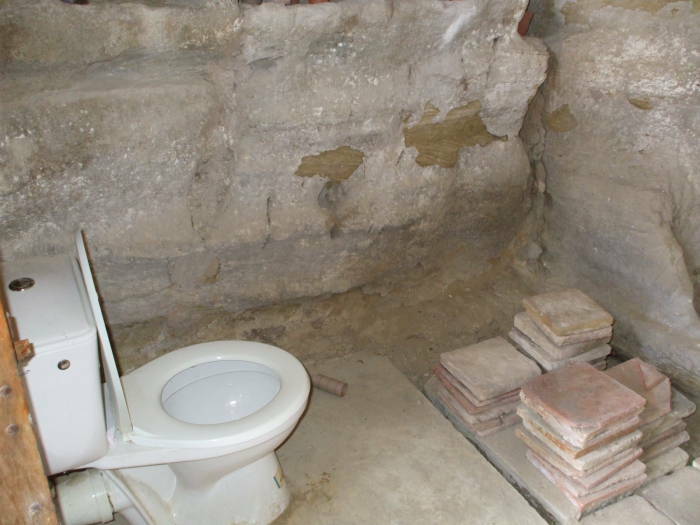 We will also see toilets in brasseries, monasteries, canal boats, and the famous sewers of Paris. Where are the toilets? Où sont les toilettes? As for signs indicating the way to public toilets, you may see TOILETTES or you may see WC. 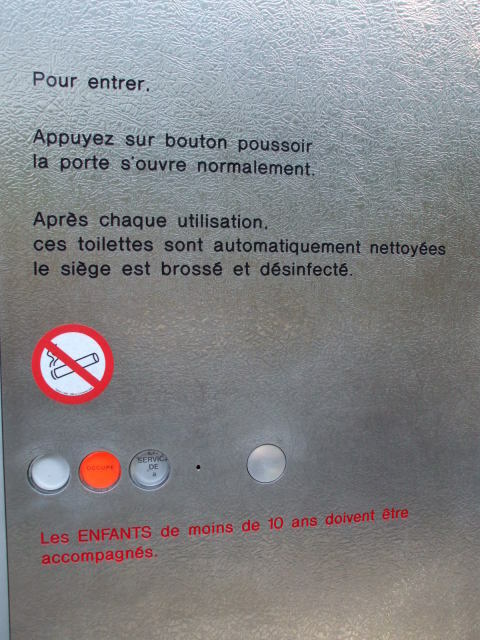 The page of toilet signs shows some examples from France. 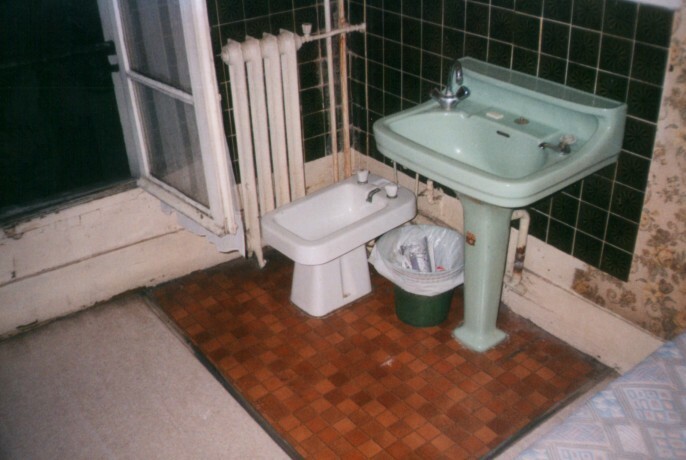 This is the sink and bidet in my room at the Hotel de Medicis in the Quartier Latin of Paris. Jim Morrison stayed in a nearly identical room just below this one. 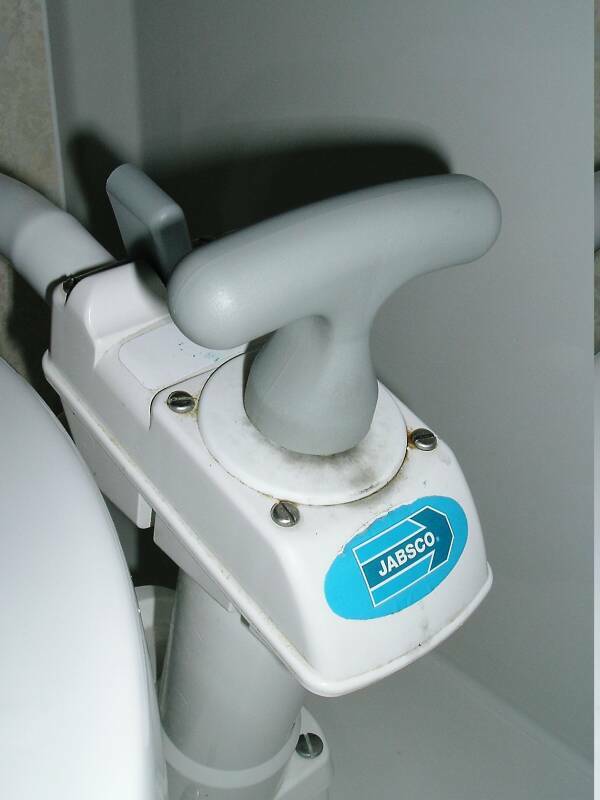 See the page on Jim Morrison's Bidet and Sink for more on this specific plumbing. 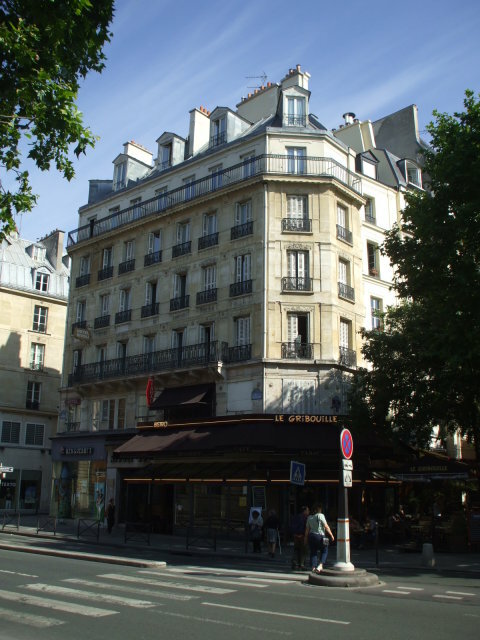 See my page about Jim Morrison in Paris for more about this hotel and his time in Paris. I stayed in the hotel in the late fall of 2001. It was a great old atmospheric and very low cost hotel. 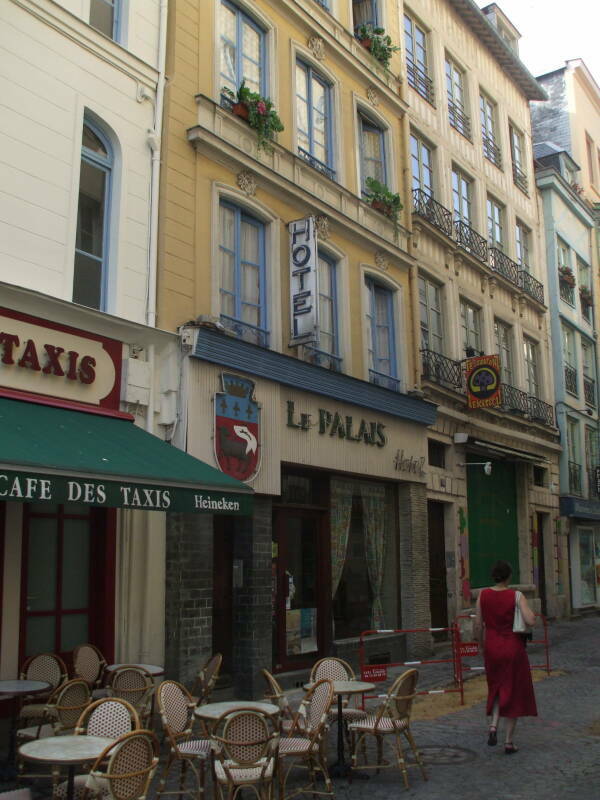 But by 2009 the historic l'Hôtel de Médicis was gone. The building had been completely gutted out and a new luxury hotel built within the original façade. Nothing beyond the technicality of a specific street address remains from 1970. See the dedicated page for more about bidets. 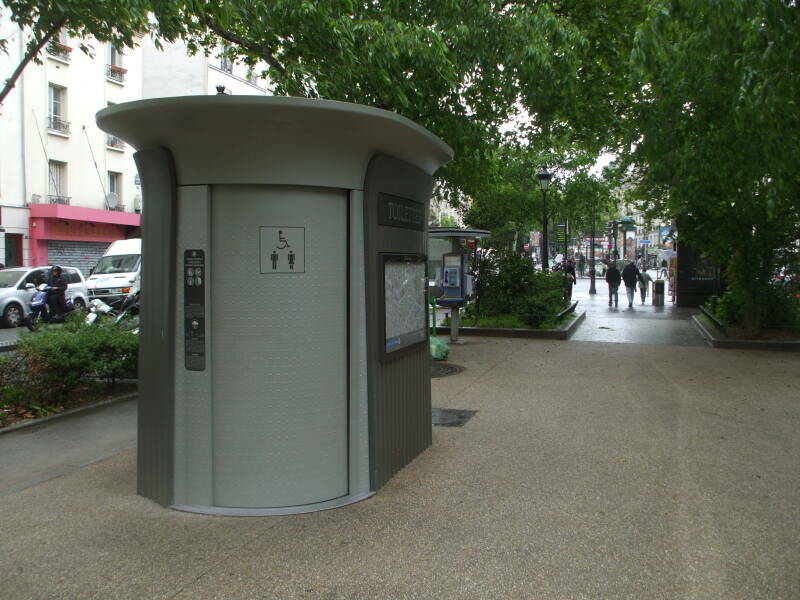 These automated public toilets are now common throughout France. 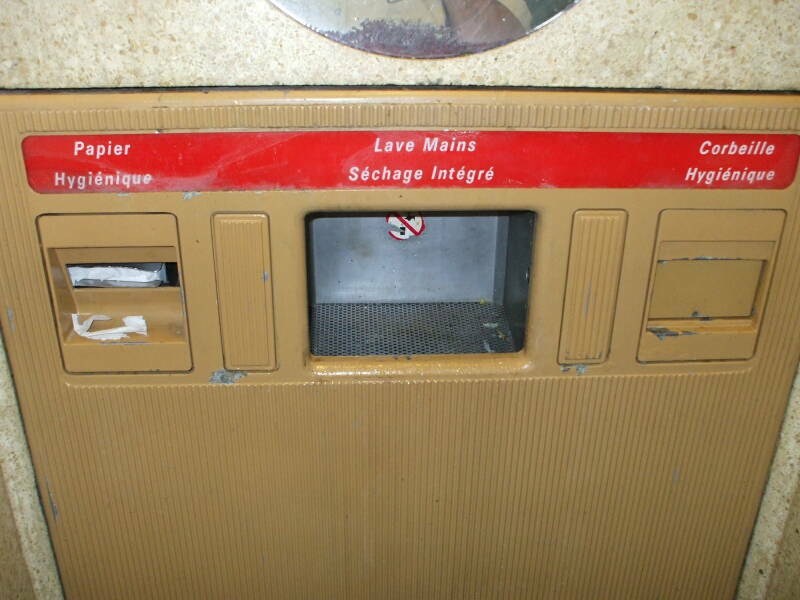 Originally coin-operated, now they are free. 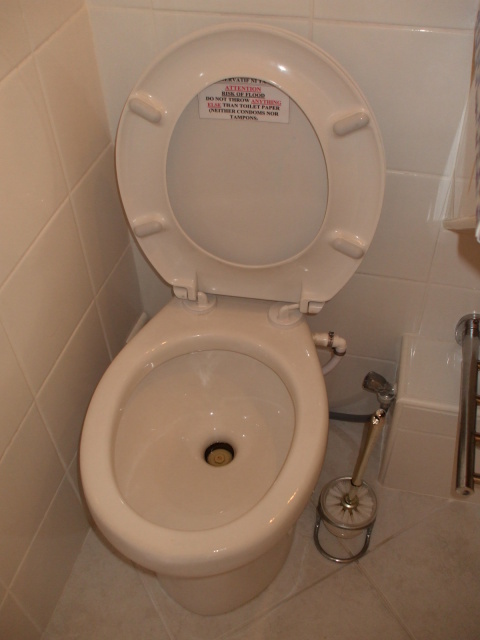 The newer design of entry panel seen here shows an orange "unavailable" indicator — the toilet is in its cleaning cycle immediately after a use. This next one in the Pigalle district of Paris, just below Montmartre, is more modern. 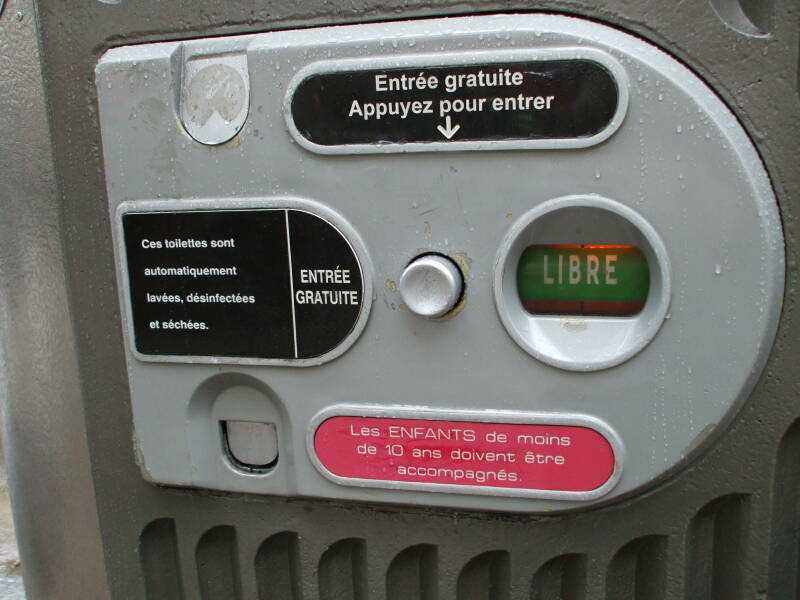 The older design shown here shows a green "LIBRE" or free indicator, it will open when you press the large button. Libre means "free" in the sense of "unoccupied", as in the French word libération which became the English word "liberation". Gratuite means "free" in the sense of "no payment required." It's seen twice on this panel as Entrée gratuite or "Enter without needing to pay." All of them are gratuite all the time, but they're only libre when no one else is already inside. Then press the button and the door opens. 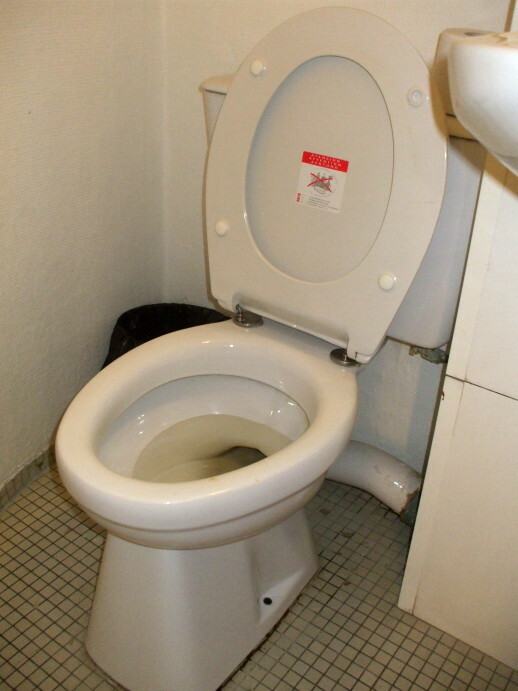 The toilet design has changed over time. The older ones, like the one seen here with a slightly yellowish bowl, had an unusual design. The bowl was just that — a bowl with no drain. It is flushed after you leave the compartment by rotating back into the wall and being hosed out. The seat surface is a rounded ridge down either side but it's open at both the front and back. The opening at the front is like the typical horseshoe shaped seats found on public toilets. The opening at the back allows the waste to wash out when the bowl is rotated vertically back into the wall and sprayed out. 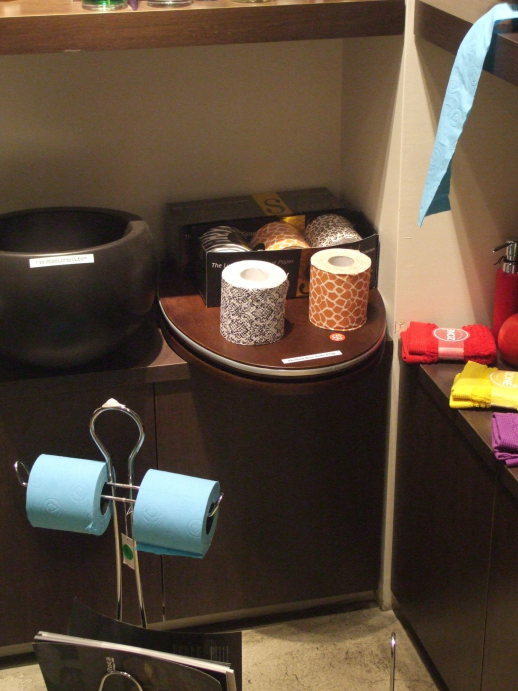 The newer ones, as seen here with a bright white bowl, have a more conventional design. But the bowl is still retracted and sprayed down after every use. 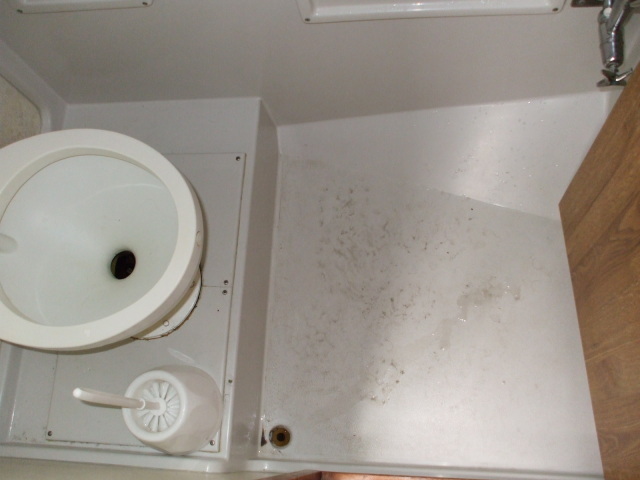 Compartments on the panel above the toilet dispense toilet paper and provide water, soap, and hot air for hand cleaning. A floor sensor detects whether a person is really inside or not. If there is no person, or after a period of time even if there is a person, the door automatically opens. After the person steps out, the door closes and the entire interior is sprayed with a disinfectant. 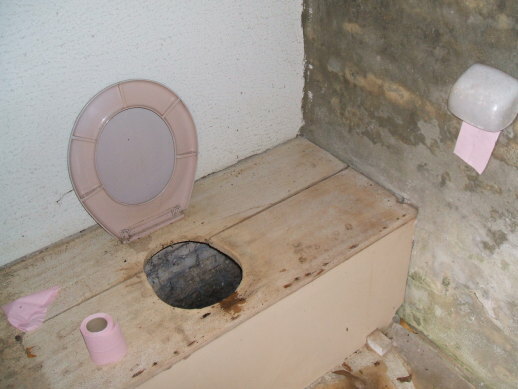 The toilet bowl is rotated back into the wall and hosed out. After this quick cycle of 60 seconds or less, it is available for the next user. Also see the Futuristic High-Tech Toilet page for more automated toilets. 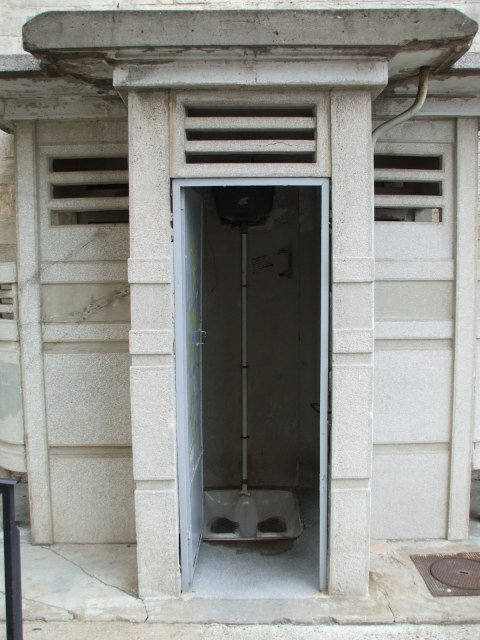 I hope that this will give no offense, but the French term for a simple public urinal really is pissoir. 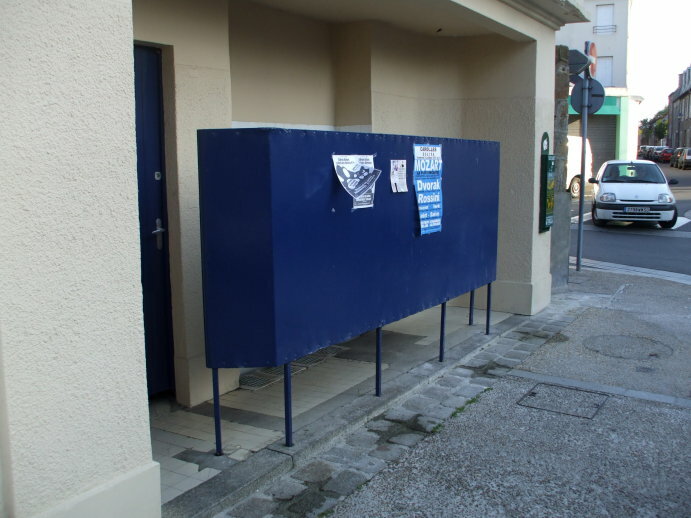 Here is a pissior public in Avranches. Wait, that's redundant. 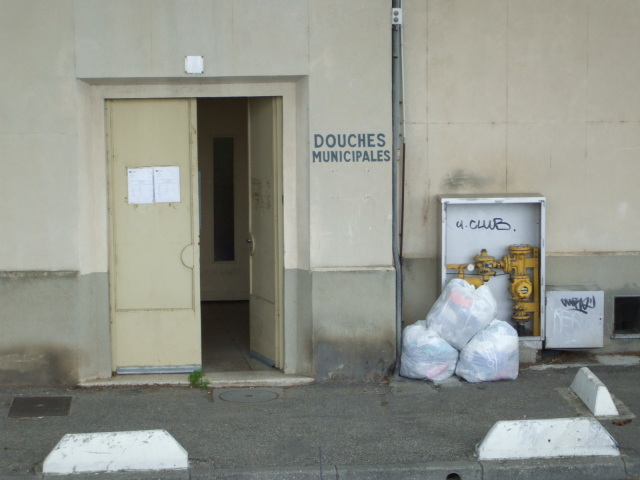 Tous les pissoirs sont publics! The Romans finished their Amphitheatre in Arles in Provence in 90 AD. It could seat 20,000 for entertainment spectacles including chariot races and gladiatorial combat. The Amphitheatre is large, 136 meters long and 109 meters wide with two levels of 120 arches each around its exterior. Click here to see more about the Amphitheatre and other sights in Arles. Here you see one of the modern men's rooms in the Amphitheatre. A urinal provides a nice view right out the window to the municipal park in the small town of Cours-les-Barres, along the Canal Latéral à la Loire in central France. 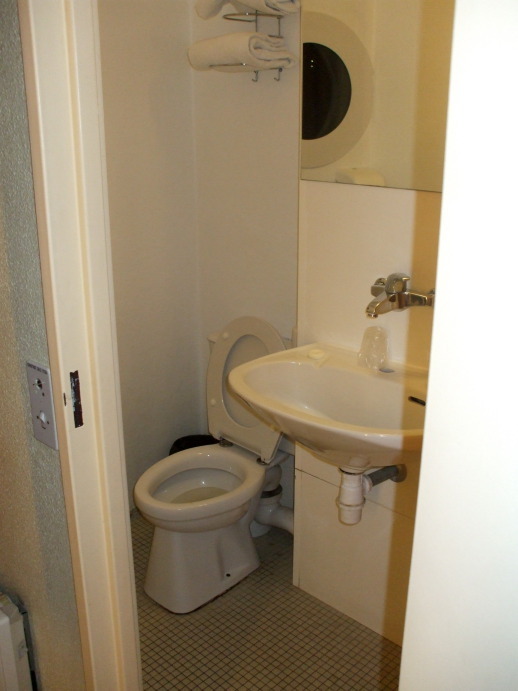 Lower-cost hotels in France often feature toilette au couloir. That is, the toilet is down the hall. Les Baux-de-Provence is a small old town in a rugged area in southern France. Its hilltop site was occupied back to 6000 BC, and it was an Iron Age hill fortress around the 7th to 6th century BC. 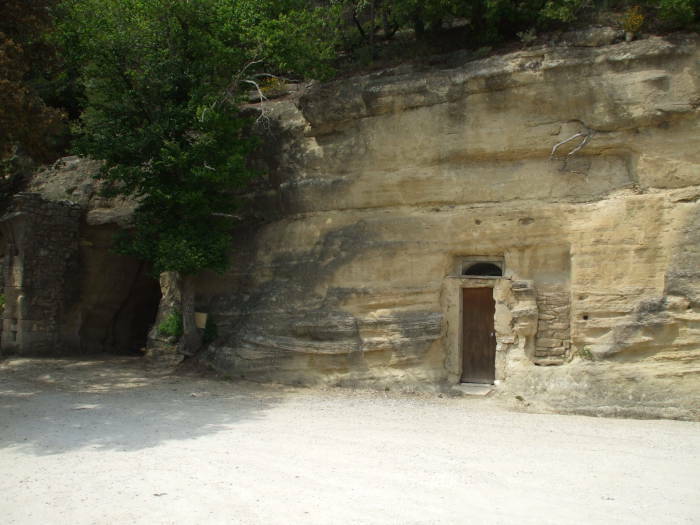 The occupants started several limestone quarries in the nearby area in the 2nd and 1st centuries BC. The town expanded and became the stronghold of a feudal domain in the Middle Ages. 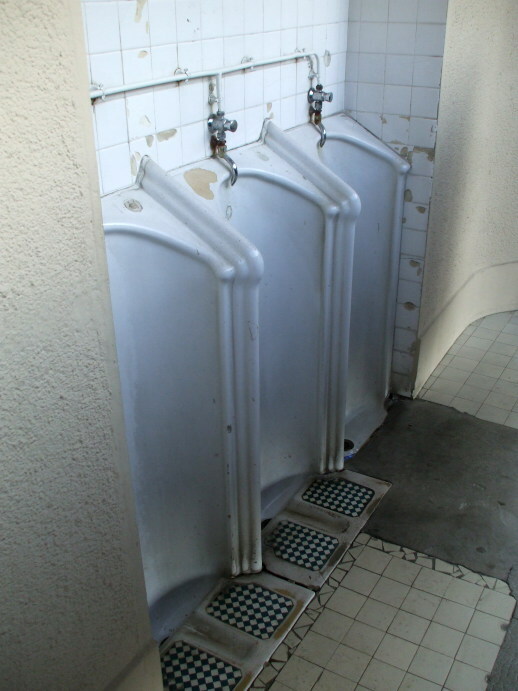 As often in France, the urinals in the men's room (at left) are just barely inside the doorway. 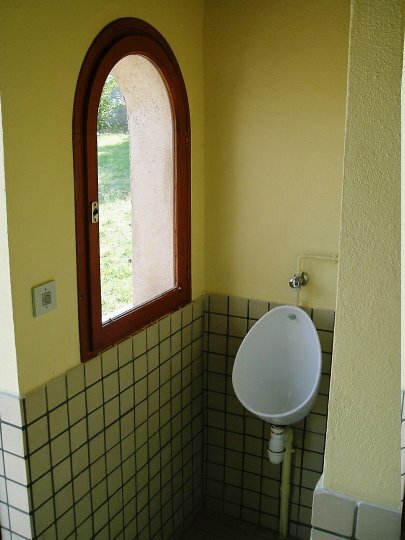 The women's (at right) offers a little more privacy. In 1821, the geologist Pierre Berthier was working in the area when he discovered the aluminum ore consisting mostly of gibbsite or Al(OH)3, boehmite or γ-AlO(OH), and diaspore or α-AlO(OH), mixed with some clay, iron oxides and other minerals. The ore takes its name, bauxite, from the location. The Hôtel du Palais in Rouen has a mix of rooms, some en suite (with their own plumbing) and some without. They have no web site or e-mail, just call them and make a reservation. Be ready to speak French. If you're looking for the toilette au couloir, it's actually in the open light well rather than the couloir. 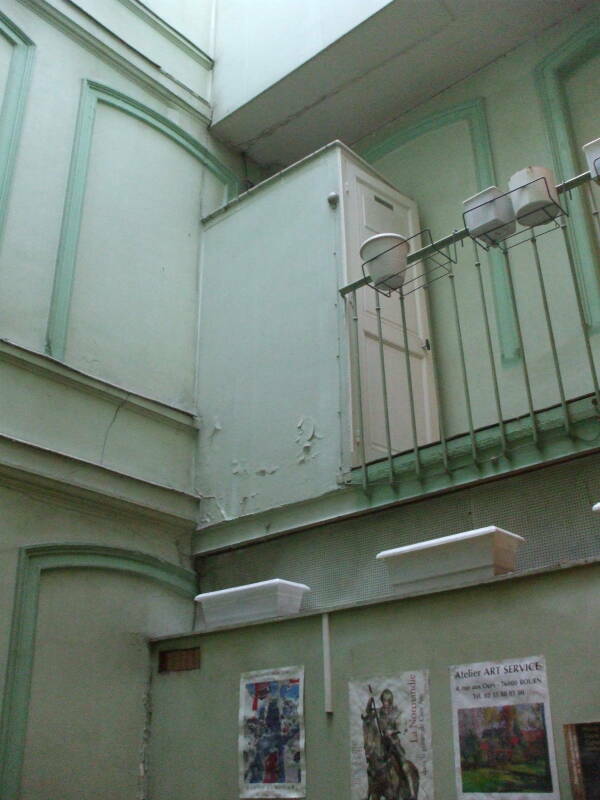 There's one in a little cabin on the next floor up. Tired of plain old white toilet paper? 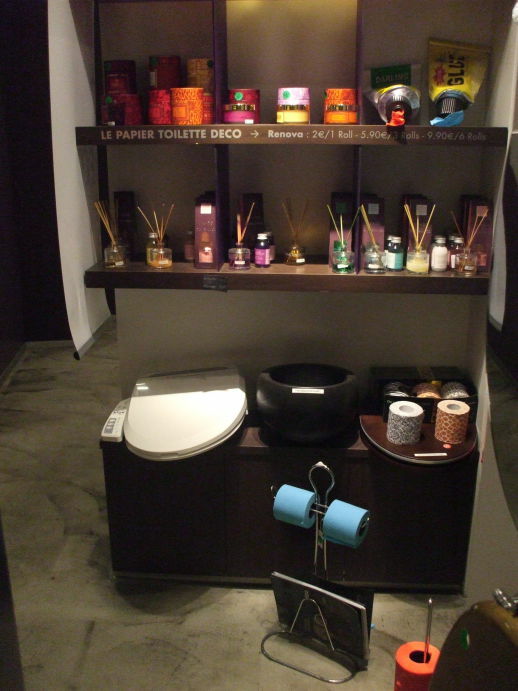 The Printemps department store in Paris has a small special section for decorating your bathroom, to the point of brightly colored and patterns toilet paper and designer toilet seats. This section is appropriately next to one set of public toilets. 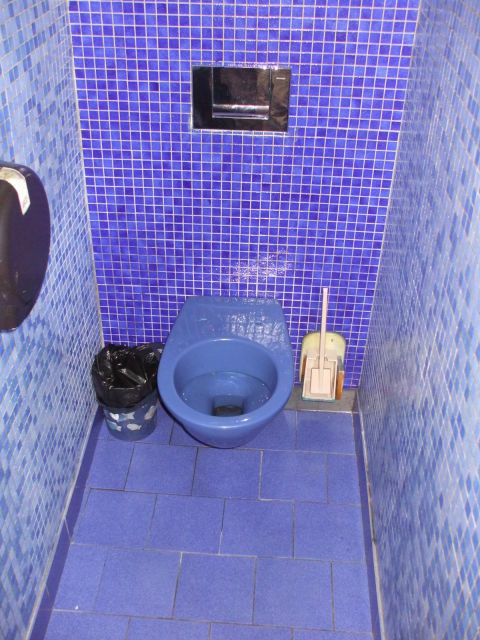 This very blue toilet in a very blue lavatory is in a brasserie near Notre Dame in Paris. The Hôtel Première Class chain, despite its name, is a fairly low cost and basic French hotel chain (the Formule F1 chain seems to be the next step down, with shared baths at least in some locations). 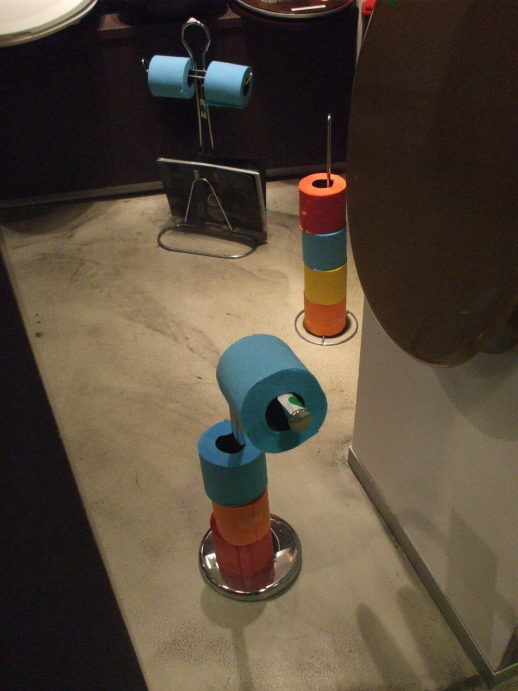 This is the toilet in a room at their hotel in Cergy-Pontoise, just outside Paris. This upscale squatter is found in a brasserie in Béziers, along the Canal du Midi. 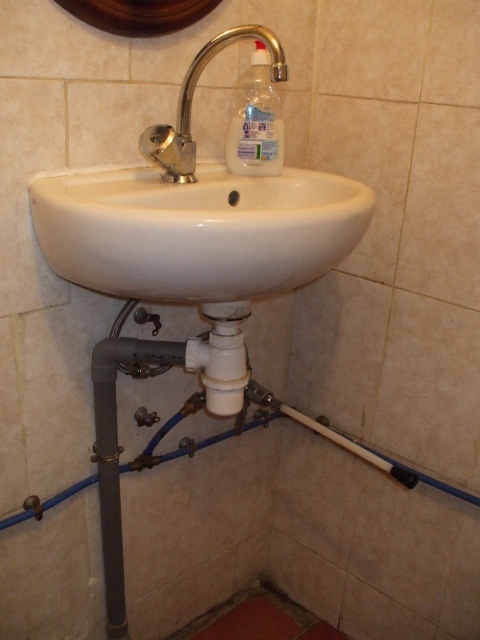 This sink with a knee-controlled valve is also in Béziers, in a kebab shop. It's much cleaner this way! 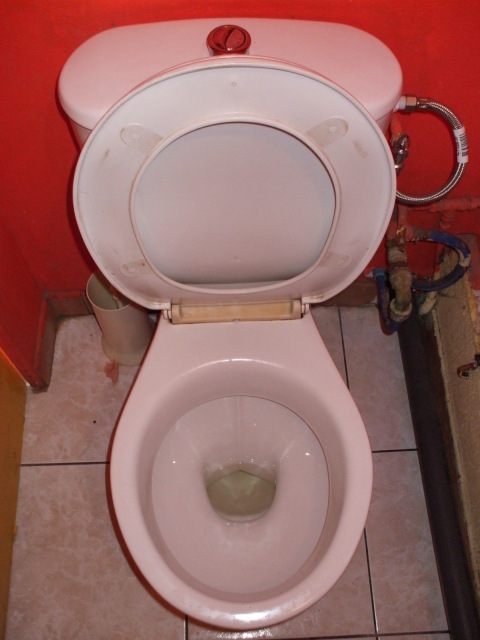 The toilet is at the beach-side restaurant La 7eme Vague (The 7th Wave) in Port Cassafieres, near Béziers. As commonly found in Europe, the flushing control is a tank-top split button allowing you to select just enough for #1 or a full flush for #2. 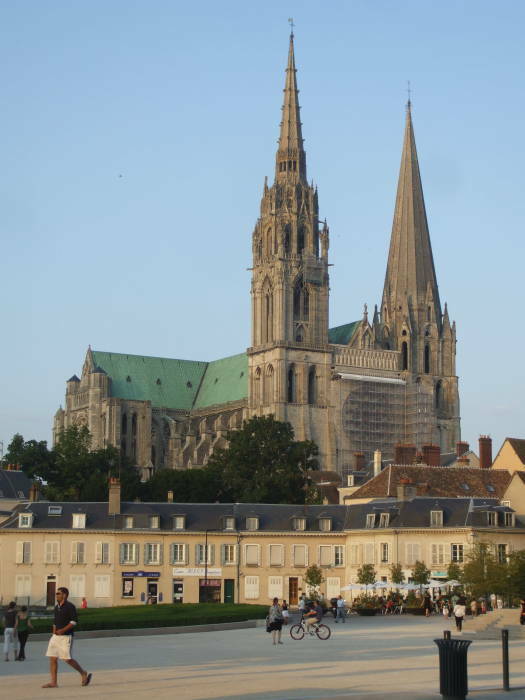 First, you see Chartres Cathedral. 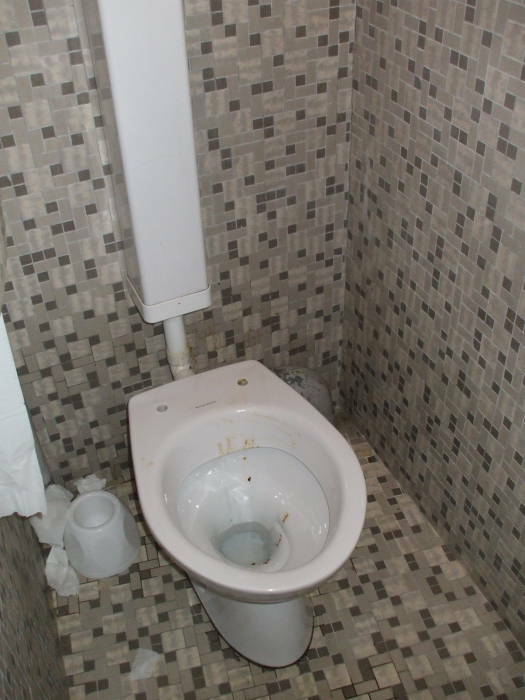 Then you see the rather dingy toilet in the nearby underground parking facility. 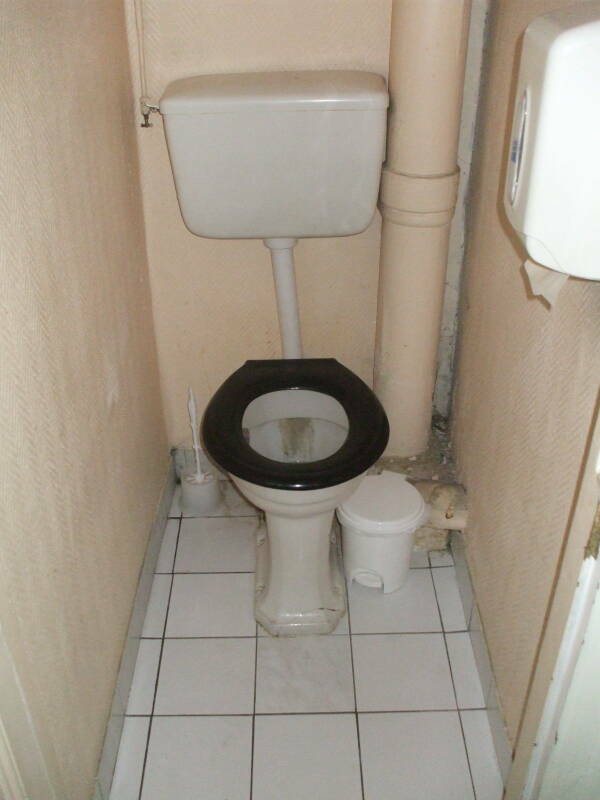 As discussed on the Squat or Sit page, brasseries in Paris often have just a squat toilet. 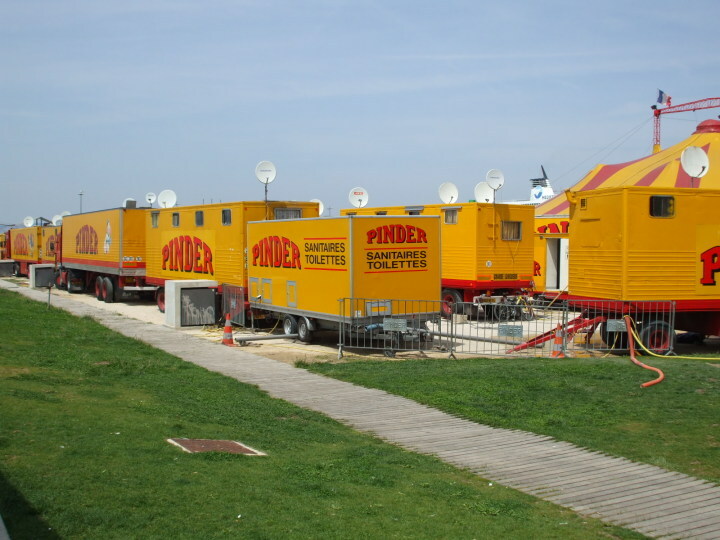 If you were wondering what French circus toilets might look like, the answer is that they are in brightly colored trailers. At least, that's the case for the toilets used by the personnel of this circus. This circus is next to the waterfront in Marseille. 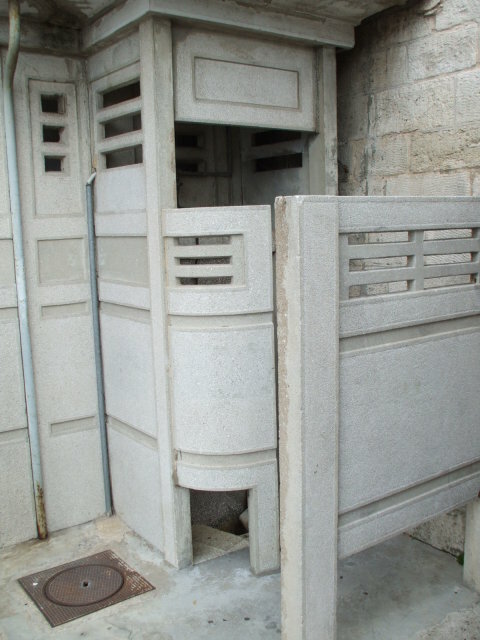 These very sturdily built concrete public facilities, a urinal and a squat toilet, are in Arles, along the bank of the Rhône. As in, "I'm going downtown to take a shower"? These are somewhat mysterious. They are also in Arles, close to the above concrete facilities. 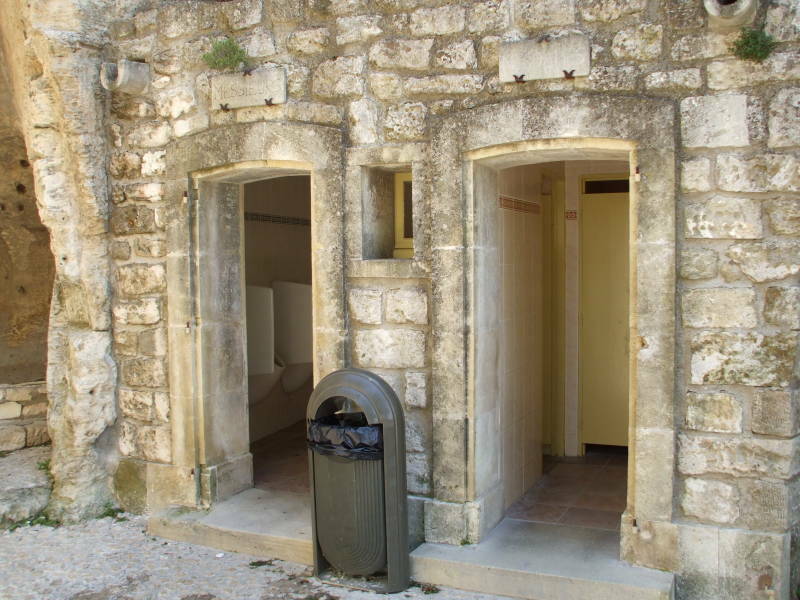 This rock-cut toilet facility is at the Monastery of St-Hilaire, in the Luberon region of Provence, east of Avignon. 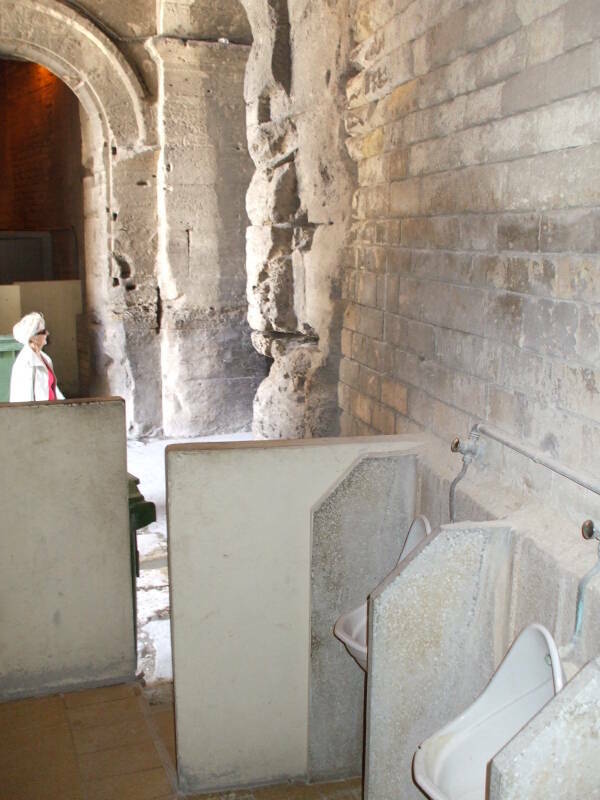 Click here to see the medieval communal toilets used by the monks. 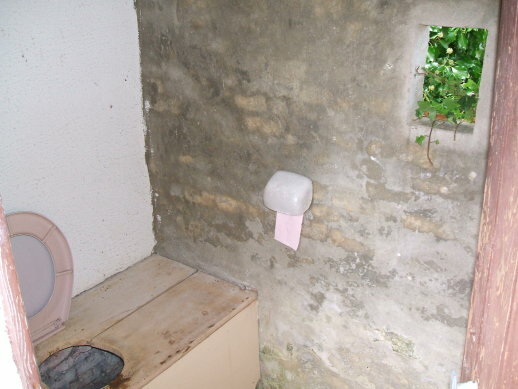 The outhouse behind the church in Angoville au Plain, in Normandy, has a limited view through a window. This is an unusual flushing mechanism I encountered for the first time in a small hotel in Avignon. A hidden tank is filled. That water is dumped into the bowl. 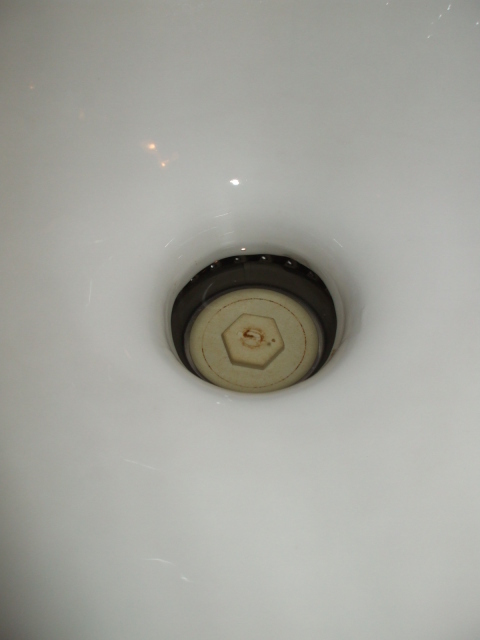 The plug-like impellor drops maybe two cm while spinning rapidly and a powerful vacuum attempts to pull the material in the bowl into the drain. The hidden tank is filled again. Another suction flush cycle with impellor spin occurs. I experienced a failure. Yes, yes, I had stopped it up and I had to poke around with the handle end of the toilet brush, and then clean up the resulting mess. At least it did not go horribly wrong. The high-speed spinning hub seems to risk a rather spectacular failure mode. 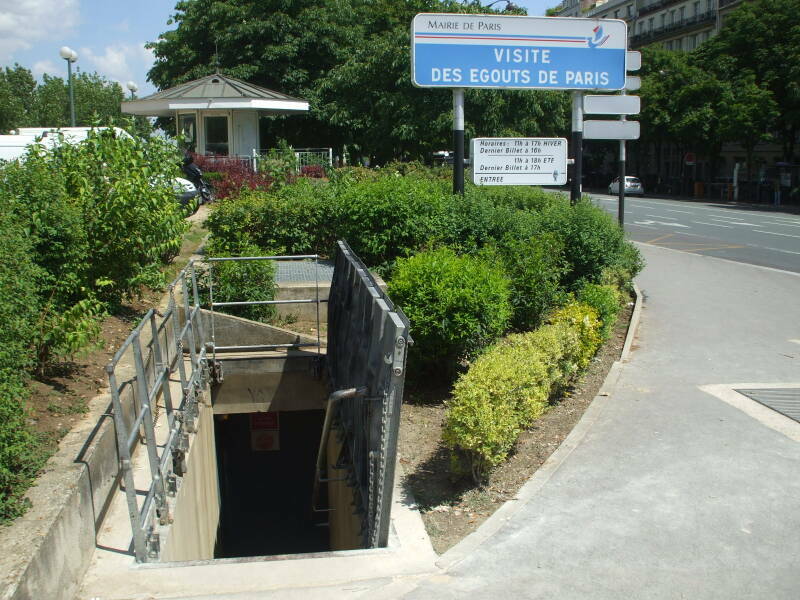 Yes, you can tour the sewers of Paris. And yes, of course I took pictures. 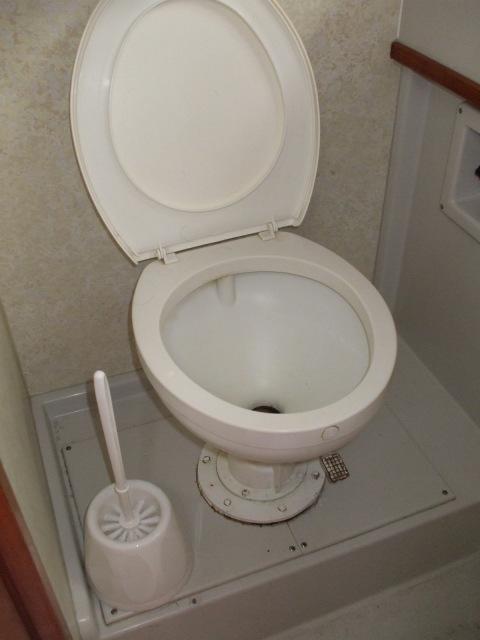 The first picture below is one of the heads and the flushing mechanism on board a rented Crusader canal boat in France. The second picture is the head on an Orion, a very similar rented canal boat in France. A bow thruster was added to the Crusader design. The main helm position is designed a little differently. The domestic water supply is designed differently, with multiple much smaller pressure tanks on the earlier Orion versus a single much larger pressure tank on the Crusader. 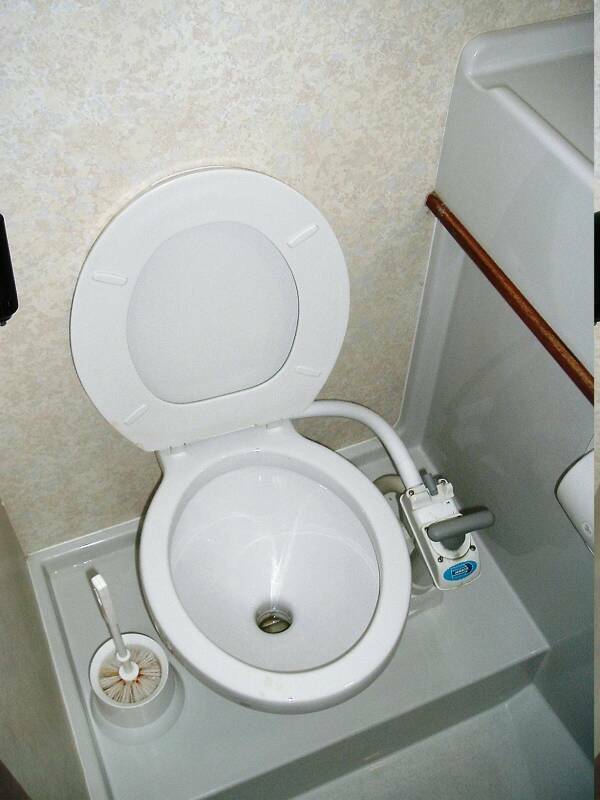 The simpler toilets on the earlier Orion, worked much better. 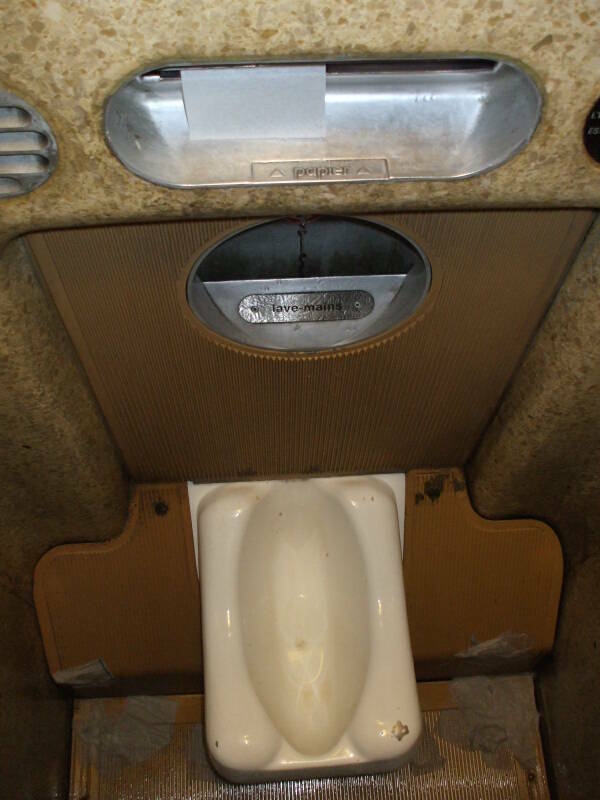 The Orion toilets are operated by pressing a waterproofed button on the panel below the counter to pump water into the bowl, and stepping on a foot pedal (barely visible below the bowl in the next-to-last image) to open the large flapper valve into the holding tank. For much better performance, use the detachable shower spray nozzle. The entire head compartment is the shower, the last picture shows the drain in the floor. The Crusader heads had a complicated and poorly performing T-handle pumping mechanism. I have taken these on trips on the Canal Latéral à la Loire between Briare and Decize, and on the Canal du Midi between Port Cassafieres and Castelnaudary. Click here for many more pictures of those trips. 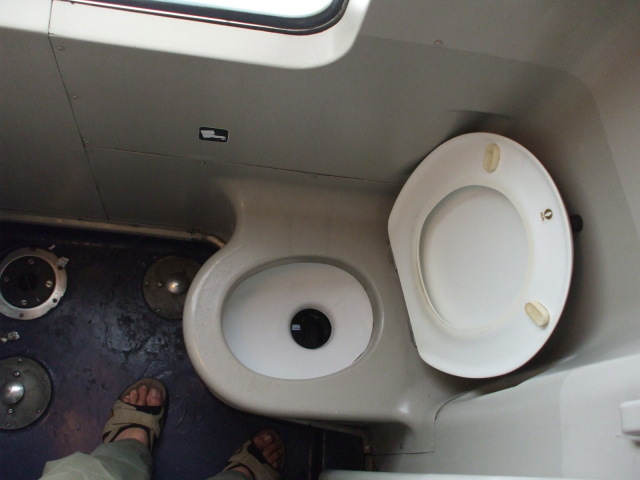 This Toilette a Grande Vitesse or High Speed Toilet is found on board the TGV or Train a Grande Vitesse, the High Speed Train running through France. Before leaving my seat, my GPS had synced up and was indicating a speed of 305 km/hour. 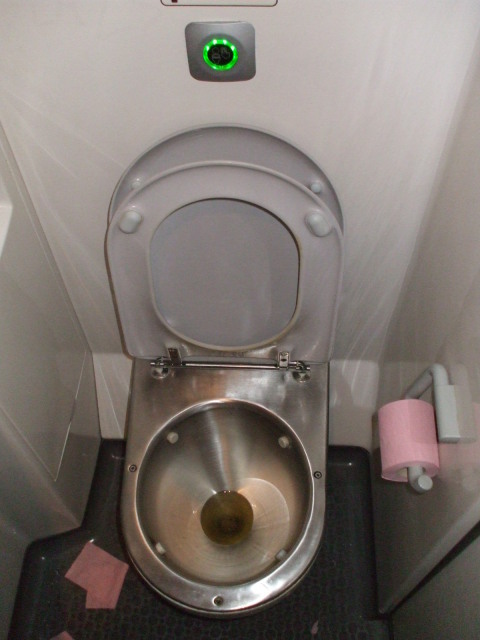 The second toilet, with a lighted green flush button, is on an newer RER regional train in France, running between Marseille and Béziers. 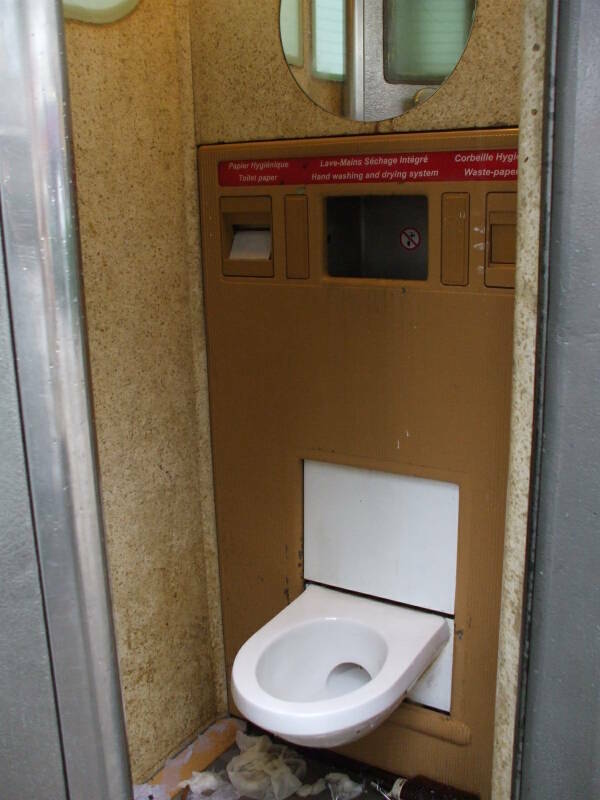 This toilet is made from stainless steel, vacuum flushed, with a holding tank. 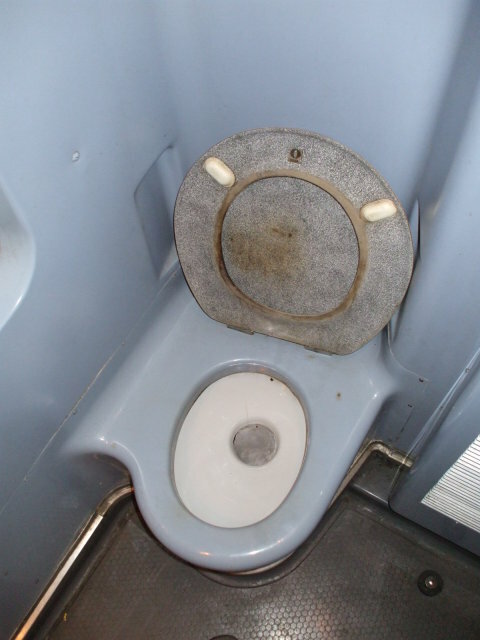 Old-style train toilets like these have no holding tank. Their flapper valve opens into a 10cm diameter pipe dropping straight onto the tracks.